From my first taste of Byron at age twelve, I was hooked on poetry. As a teen, my reading went from the Romantics to Sylvia Plath to the Beats. 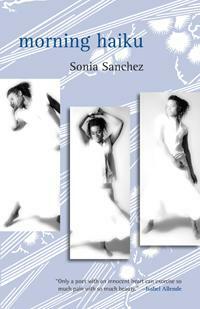 By the time I belatedly discovered Sonia Sanchez, who has been publishing astonishing poetry since 1969, I was ready. This, I thought, this is poetry: not a word wasted, and all of them well-chosen; inspirational, revolutionary, and speaking straight to the heart. With her latest volume, Morning Haiku, Sanchez takes her work to a new place of innovation and tenderness. Poet, scholar, and civil rights activist, Sonia Sanchez has amassed an impressive body of work, including over sixteen books. In her latest, she shares with the reader her discovery of the haiku form, and how it spoke directly to her heart. With skill and artistry, she crafts haiku that are dedicated to many great leaders of the civil rights movement. When I read “9 haiku (for Freedom’s Sisters),” it was impossible not to cry and to feel awed and thankful. These poems are written for Kathleen Cleaver, Betty Shabazz, Barbara Jordan, and other strong women leaders. Each haiku is, by definition, brief; but Sanchez layers the poems together, and the effect makes an intense song of praise. There are helpful yet unobtrusive explanatory notes at the end of the book, marked only with page numbers, to help the reader unfamiliar with a person mentioned in a given poem. On the dedication page for Morning Haiku, Sanchez writes: “Let me wear the day/Well so when it reaches you/You will enjoy it.” I hope this one not only takes residence in my memory, but becomes manifest in my actions.